Google Voice which has not received any form of upgrades for a vey long time is a good and cool now. Google resurrects its Voice internet protocol (VOIP) app , Google Voice alongside new features. Separate Tabs for text messages and calls which includes voice calls. 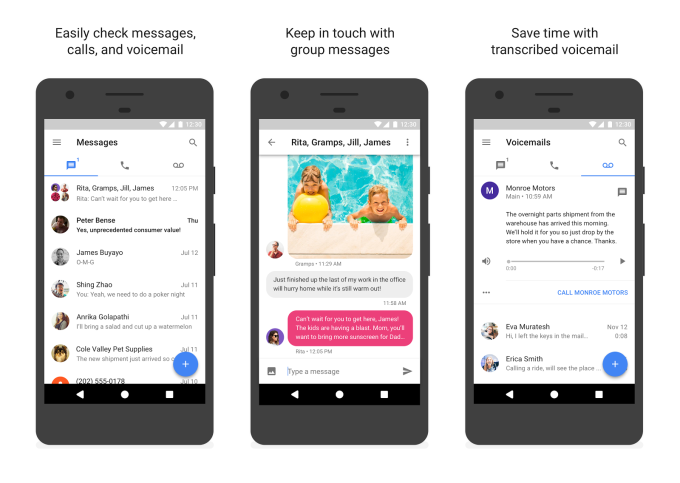 Also Threaded conversations are supported too, and Google is working with mobile operators to bring rich messaging through RCS to its users in the future. Rich Communication Services RCS is a communication protocol between mobile-telephone carriers and between phone and carrier, aiming at replacing SMS messages with a text-message system that is more rich, provide phonebook polling (for service discovery), and transmit in-call multimedia. Google also notes that the Hangouts integration with Google Voice has not changed with the relaunch. That is, if you prefer to use Hangout as your messaging app, you may continue to do so.